Ten o’clock, Friday night, Tucson. I play the first song of a four-hour set. It’s a remix I made of my favorite El General song, “Pun Tun Tun.” The backbeat is reggaeton-influenced, and El General’s vocals are drowned out with some woozy synthesizer chords. This is the song I use to welcome the party-goers, many of whom have just left their weekly routines behind and are now dressed up to riot with the rhythms I have in store. I’m a resident DJ for El Tambó, a tropical dance party hosted at the Historic Hotel Congress. Instead of top 40 hits or party classics, I play songs from across the Americas and the Caribbean. My crew is Sonido Tambó: DJ Dirtyverbs, founder; Jackie Blüm, manager; Quiahuitl, percussionist; Mataruda, graphic designer; DJ Humblelianess, resident DJ; and me, DJQ. As artists, we believe music and dance parties are a vehicle for unifying community under the guise of celebration. Jackie and Mataruda’s work behind the scenes, taking care of logistics and our overall aesthetic. Quiahuitl plays alongside the DJs, matching and complementing our songs on her timbales and Octapad, a digital percussion pad. Dirtyverbs, Humblelianess, and I alternate Fridays as lead DJs, always supporting each other by backseat-DJing or being an extra pair of hands on standby. As more people fill the dance floor, I cue up a crowd favorite, “Que Nadie Sepa Mi Sufrir” by La Sonora Dinamita, an iconic cumbia band from Colombia. Then I transition into “Quemame” by Sister Mantos, a queer multi-instrumentalist group from Los Angeles. I notice how these two songs stir the crowd. Both of them are about heartbreak, but the melodies parade a joy that make the feet stomp out sorrow. I see bodies swaying. I see people greeting each other with hugs and laughter. These songs speak to the spirit of El Tambó—a space where Tucsonans can convene and enjoy rhythms both familiar and new. El Tambó is more than just a Latin dance party—it’s a kinetic happening that welcomes community organizers, educators, and both experienced and amateur dancers to move their bodies to cumbia, reggaeton, dancehall, Afrobeats, dub, and any intersection of these tropical and diasporic musical genres. Our name comes from, “el llamado del tambor,” the call of the drum. The call precedes the cumbiamba, the cumbia circle. El Tambó is a call to the Tucson community to come and dance the sweat of stress, of survival, of sorrow out of the body—purifying the spirit through rhythm and movement. Close to midnight, the party reaches the first climax, and I carry out my ritual, dropping “Handsome Skunk Cumbia” by Gertie ‘N’ The T.O. Boyz, a waila band from the Tohono O’odham Nation. 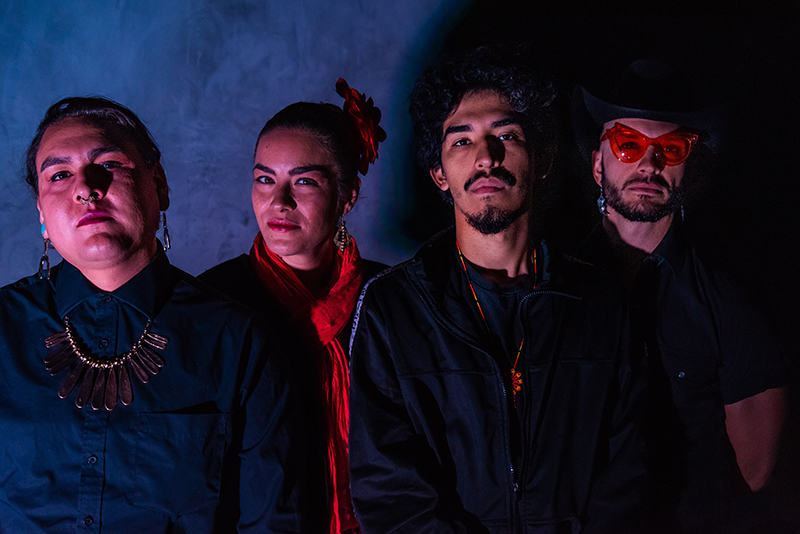 Waila, known colloquially as “chicken scratch,” is dance music created by Tohono O’odham musicians that pulls from música norteña, conjunto tejano, and O’odham musical traditions. We leave the tropics sometimes to bring it home to the Sonoran Desert. Bands like Gertie ‘N’ The T.O. Boyz and Native Creed, another waila band from the Nation, are important to our story of place and history. We acknowledge that our party happens on occupied Tohono O’odham land. Waila is both an invocation of a largely forgotten truth and a way of honoring the people whose land and stories are buried beneath the concrete we dance on. Sonido Tambó, from left to right: Quiahuitl, Humblelianess, Q, and Dirtyverbs. When the party is pulsing with joy and the crowd begins to fill the dance floor, I keep my eyes down and focus on my hands. I concentrate on the song I’m transitioning into. Once that song is cued up, I contemplate the next four or five songs. My sets come from both digital files and vinyl records. I use a pair of Technic turntables and a Pioneer DJM-S9, a professional 2-channel mixer that I use with Serato DJ, a vinyl emulation software. This lets me manipulate the playback of digital audio files on a computer using the turntables as an interface. It’s a way of making the digital analog again. I can keep the hands-on control and feel of DJing with vinyl, but I have the liberty to play tracks that may not exist on vinyl. My only restriction then is my collection: what I don’t have, I won’t be able to play. I enjoy the adrenaline that comes with being in front of people dancing and singing along, but at heart I’m an introvert. Big crowds both fascinate me and terrify me. When I first started DJing in 2013, I shadowed Dirtyverbs for a few months. Then he offered me my first 45-minute set on the plaza stage. I can still remember how my hands trembled trying to drop the needle onto the first record. Back then El Tambó wasn’t a regular event yet. We only called it “El Tambó” on special occasions, when there was a cumbia band playing inside the club or on the plaza with us. In those early years, we’d only get some 200 people on and off the dancefloor. As I became a better DJ and even got booked for my own sets, our party grew in size. Four years later, when I was offered my first solo night, some 700 people came out to dance! As the party’s intensity picks up, I sometimes let my mind wander through memories. I think back to the music my parents played on Saturday mornings, while we did chores around the house. The sounds of cumbia colombiana filled mi amá’s kitchen as she prepared us breakfast. From the garage, where mi apá spent his weekends, baladas románticas blasted from the speakers. Any activity at my household required rhythm. Maybe to make the chores bearable? Maybe to distract us from how many chores we had to do? Family gatherings, on the other hand, were where upbeat party songs like “Cumbia en la Playa” by Grupo Kual or “El Tiburon” by Proyecto Uno reverberated through the laughter and the stories to get everybody dancing. Now, as a working DJ, I rotate the songs I learned from my family with the songs I’ve discovered on my own journey as a self-proclaimed ethnomusicologist. Balancing contemporary pop music of Latinoamérica and the classics I remember from backyard pachangas, I am able to transport the dancers from Colombia to Mexico to Puerto Rico all the way back to Tucson in time for closing. I tend to close out the night with a song that simmers the energy down and asks people to leave everything on the dance floor. I drop a rebajada version of “Llorar y Llorar” by Los Ángeles Azules, a legendary cumbia sonidera group from Mexico. This song is about a lover lamenting the time that passes after a cataclysmic break-up. It’s my closing song because leaving the party feels like a break-up—my heart and the hearts of all the dancers were in sync for hours. It’s only right for me to play a song that’ll tug at someone’s memories, one last time. Or at least until we all come back next Friday, to remember the good, let the music lift us, and stomp the sorrows out of our souls. 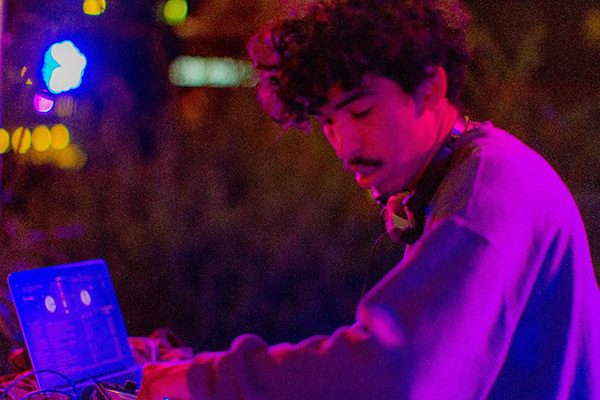 Enrique Garcia Naranjo, also known as Q, is a poet, DJ, and cultural worker from Tucson, AZ. Their work is centered on Mexican-American identity in the borderlands. Learn more about El Tambó on their Facebook page. El Tambó Fest 2019 happens on April 26, 2019 at Hotel Congress in Downtown Tucson. The one-day festival brings together legendary cumbia bands from across the borderlands and cutting edge DJs from across the nation.